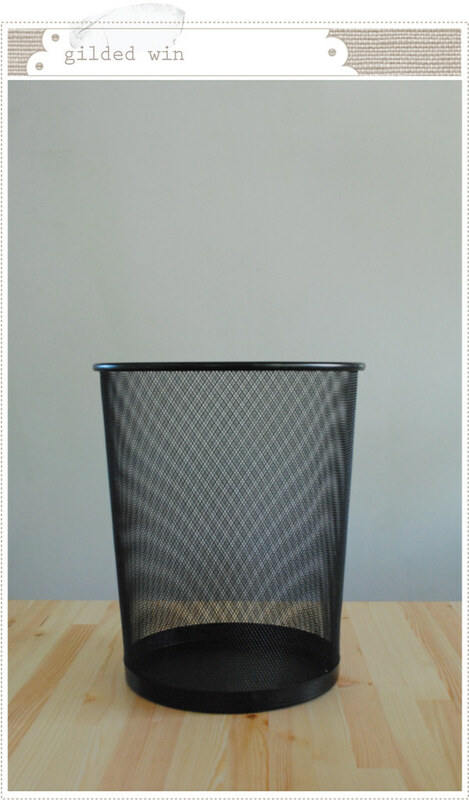 I'm not a big fan of run-of-mill office items, so whenever I would look at this boring wire mesh office bin (which held my wrapping paper rolls) I would cringe a little. I'm not even sure where it came from. My college dorm days? Jon's? I don't know. Wherever or whenever it came from, it needed a face lift. So with a little gold spray paint and minimal effort I was able to transform this drab little bin into a gilded win (I know...where do I come up with these fantastically cheezo titles, right?...). 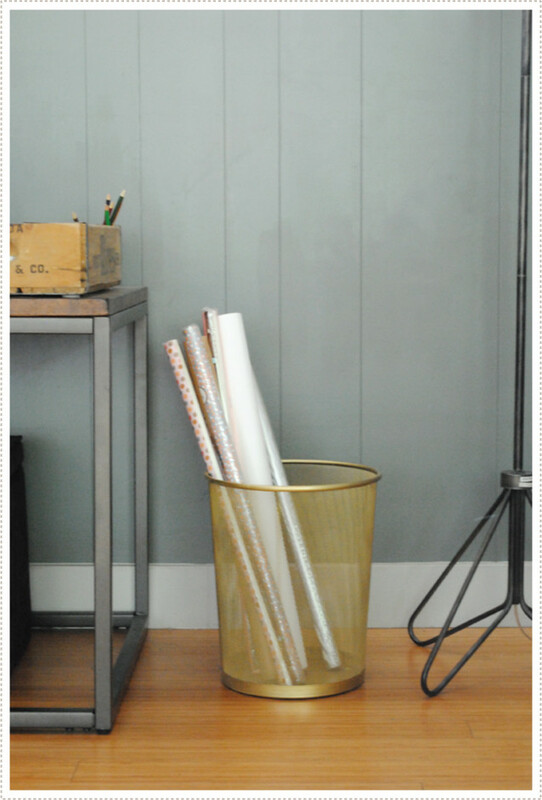 Now I love it so much that I can't bear to hide it in the back room with all the rest of my craft supplies. So it makes a statement here in the living room/office area. Oh how I love simple transformations that have a pleasing and strong impact in then end. Total win. Hi Friends! 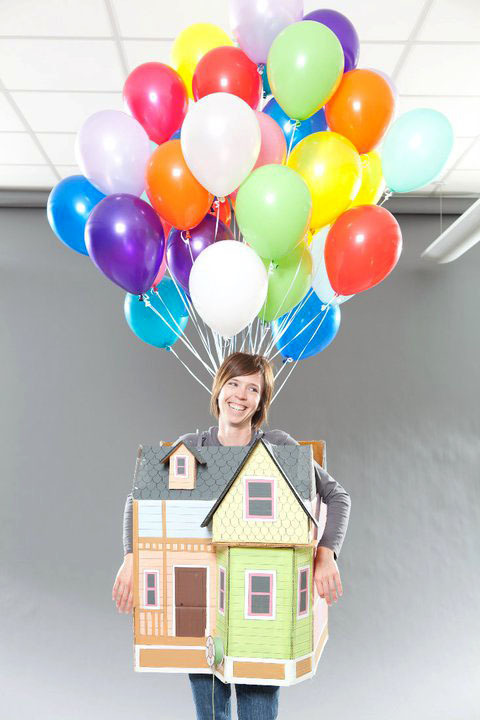 If you are like me, you are anxious to get your kids costumes in the works in order to leave time for lots of Spooky fun during the month of October. 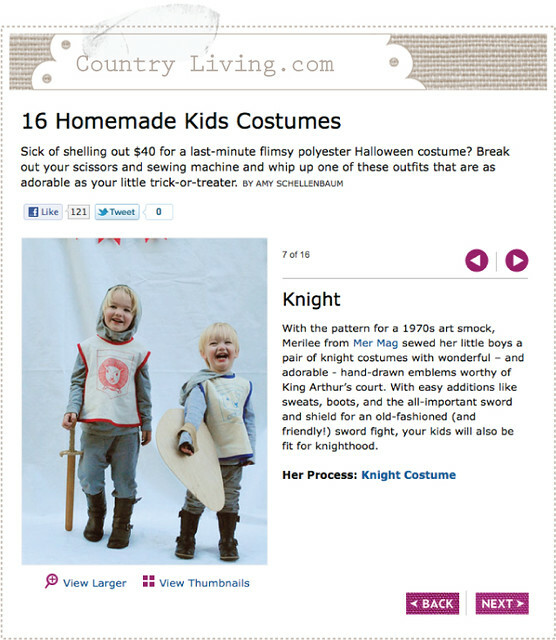 And if you want some great, yet simple, costume ideas, Look no further than CountryLiving.com. Our knight costumes from last year were in the line up as well as several of other clever costumes, including some great ones from a handful of friends such as Brooke, Christy (an old art school friend who is the queen of clever costumes! See more from her here and here) and Gabby. You are sure to be inspired! 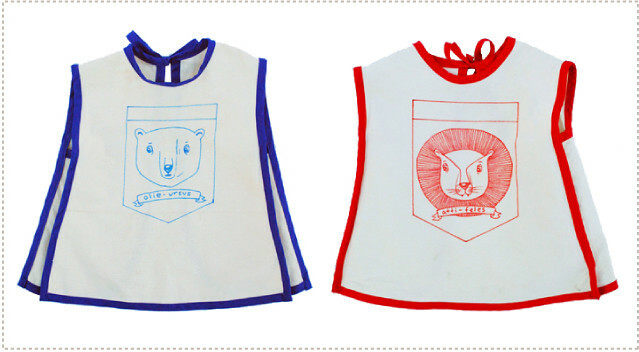 And for the knight costumes, if you don't happen to have a vintage art smock pattern lying around, I think the bias trim apron, from Leisel's Oliver + S Little Things to Sew, would do just the trick. So my question for you is, when do you start making your kids costumes? 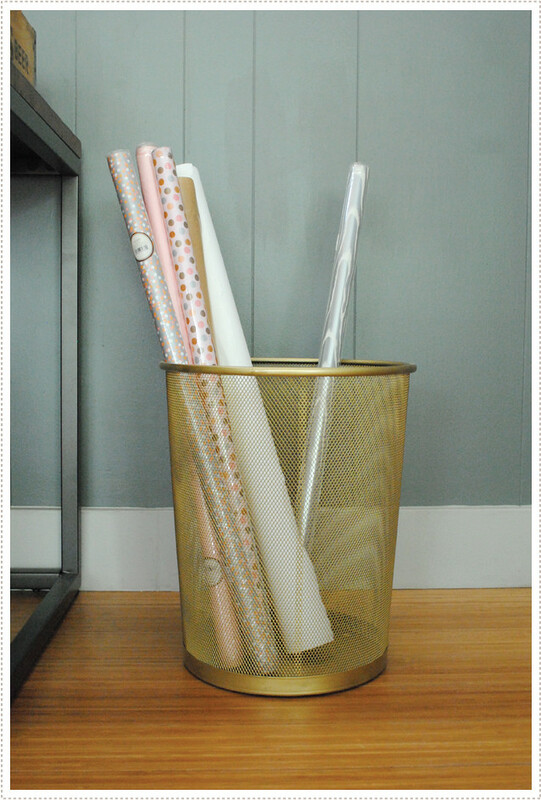 Do you wait until the last minute or are you scheming up ideas throughout the year? And do you dress up with the kids? So things are starting to look more like home around here and I can't tell you how much of a relief that is. I don't do well amidst clutter and boxes - let's just say it doesn't bring out the best in me. For better of for worse, I'm highly influenced by my surroundings. So I'm happy to report that I'm feeling calm and happy now that things are more or less in order and I'm ready leap right into fall. The boys are also really starting to feel more at ease here. 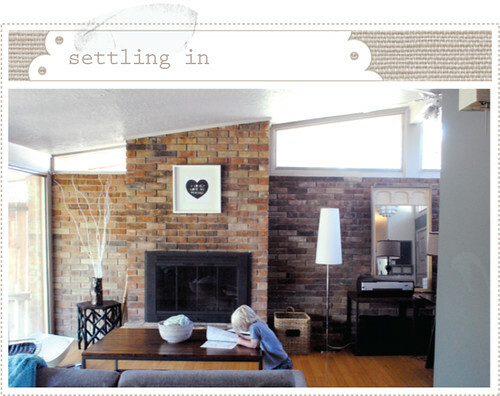 Little O is our assertive explorer and has discovered what to do with every nook and cranny in our new home. 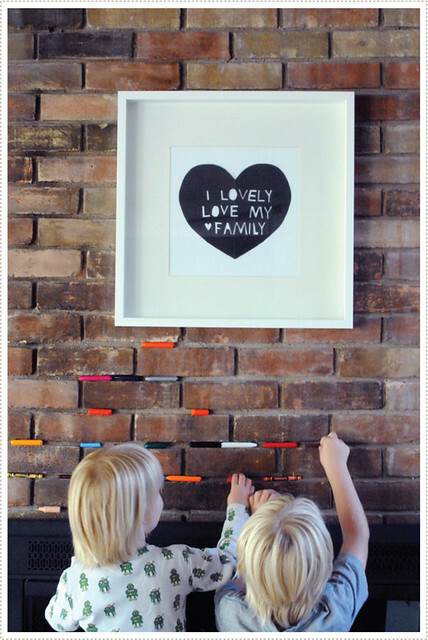 Such as this creative crayon installation that he initiated. Little A jumped right in to join in the fun. And I have to say, I'm quite taken with their creative eye. Those clever little artists. And so my only question is, is it too early to delve into Halloween? When do you start your frightful festivities? Do you wait until October or do some of you sneak into the spooky fun before the harvest month begins? Do Share! There was a sneaky bit of crispness in the air today which got me all giddy inside in anticipation for the upcoming fall weather. Little A has two week's worth of Kindergarten under his belt (and soaking it all up like a rock star). Things are starting to look a little more livable here in our new place and just in time for the delightful onslaught of fall-to-winter holidays (my kids have already emphatically declared what they are going to be for Halloween. Completely not what I expected - and they don't go together as a theme, so we're trying to see how we can pull it all together. Should be fun!). But before we get into all the Halloween costume making, we had to suit Little A up with some back-to-school/fall duds. I love to sew as much as I can for the boys but with the move there was not time for this so we had to turn to our trusty shop spots. 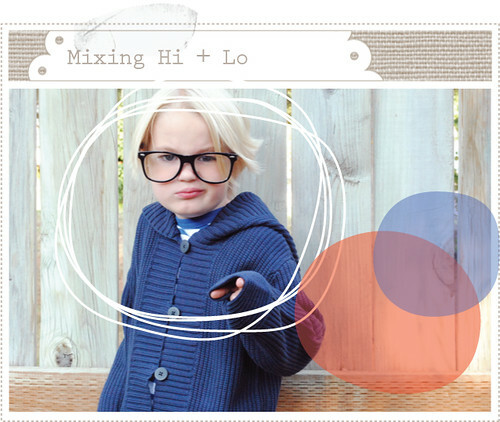 And we had such a fun time doing so - mixing and matching hi end finds, such as designer looks from Tea, with a clustering of more economical, yet equally fab, staples from places like H&M, Target (my quick go-to source for boys shoes) and more. So when shopping for kids clothing, there is a lot to consider. Durability (particularly with my boys), comfort (will my kid even wear this super adorable yet somewhat constrictive jacket?) the price tag (what do I want to spend when they grow out of these things so fast?) and finally the fun one - style (which, depending on the age and disposition of the child, they will weigh in on from time to time). For me, I happen to know that Little O will be wearing these items again in just a few short years which definitely influences my shopping choices. What I try to do is purchase a few really high quality items that will last for the long haul, and be carried on down to Little O in a not so "I'm so worn out its a dead give a way that I'm a hand-me-down" sort of way, and then mix them with an assortment of more affordable staples and kid-appealing graphic items. For example I felt like a splurge on this stunning kimono robe sweater from Tea was well worth it. Not only for the quality of the piece, but also because of it's versatility (it's almost like a jacket really) and for the fact that it will stay in good shape for Little O (and if we ever have a little girl I will totally hand it on down to her as it's a neutral enough and if taken care of, should last that long). We then paired it with a couple of more affordable pieces from H&M kids, such are these super fun and vibrant red pants and simple striped long sleeve T. As for shoes, I typically find myself at Target as I seem to need them like, yesterday. I'm always rushing my Littles out the door only to find that NONE of their shoes fit anymore! Seriously, how is this possible? So off to Target we go. And thanks to their line up of our favorite All Stars, we always seem to find something to please...and just in the nick of time. Now another thing I like to stock up on are an assortment of interesting and kid appealing graphic tees. At times I think I'd love to dress my little darlings as fine little French gents, with not a graphic in site. But let's face it, with Sponge Bob and Super Mario Bro's out on the loose you're going to have to find some pretty cool duds to combat the onslaught of licensed characters running around (especially if your child is in public school). 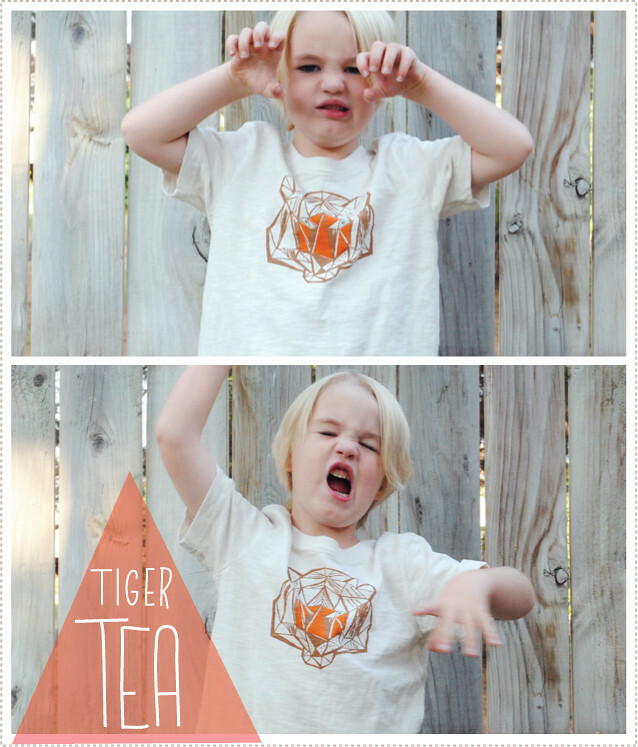 This tiger Tee from Tea does just the trick. It's super cool and invites a myriad of inquiries from both your kids friends and their parents. (And if you hurry you can nab one on sale for for only $12.50. Score!). Don't worry, I'm not that controlling of a parent. When it comes to pajamas and underwear, there are no limits. Recently their aunt gifted them a new set of Sponge Bob pajamas when we arrived to our new home, and it was like Christmas for them. The boys LOVE getting ready for bed because of this. So totally a win win, right?. One item that I wanted to be sure to acquire in our shopping extravaganza was a shirt for Little A's school photos and I think I found just the thing in this Chapultepec Polo from Tea. 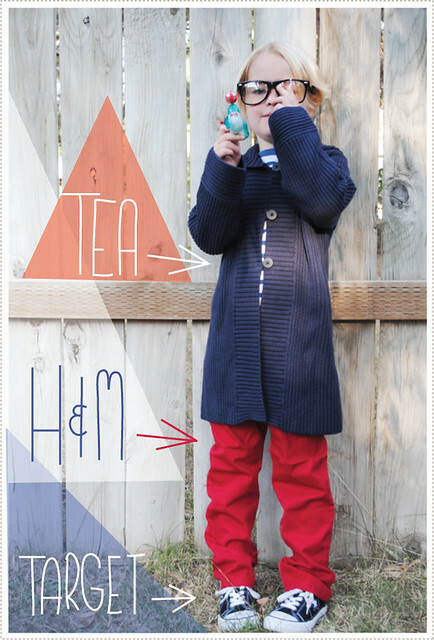 This shade of blue is a winner for Little A and I like the somewhat sophisticated yet still casual look of it. We also went for some fun denim harem pants from Zara Kids to keep things playful. Little A is still getting used to them but I just can't help but die from cuteness when I see him in these. They might fall in the "not so sure my kid will wear these all that often, but I just had to have them anyway" category which is something all of us moms need to indulge in from time to time, right? And what fall wardrobe would be complete without a great scarf? We got this H&M plaid scarf for Little A some time back and luckily he loves it and will wear it as the weather cools (which blows me away as he has a myriad of tactile and textile particularities). I also managed to stock up on a slew of items from Forever 21 Kids, such as this pearlized button up denim collared shirt, before they nixed their boy department all together (they apparently are now only carrying kids fashions for girls). And of course, we came back to our tried and true, Target, for these simple slip on canvas shoes. OK, so Fridays are serious business at Little A's school (and consequentially, for Little A as well). They are spirit days and if you wear red or a viking shirt (or both!) you get a treat and earn points for your class. The class that gets the most points wins the "Viking" to keep in their class. At the end of the semester, if your class wins the "Viking" to most number of times, your class wins a class prize. And, more importantly to Little A, you get a treat every Friday if you show up to school sporting your school pride. At back to school night they had t-shirts to purchase if you so desired. I took a look. 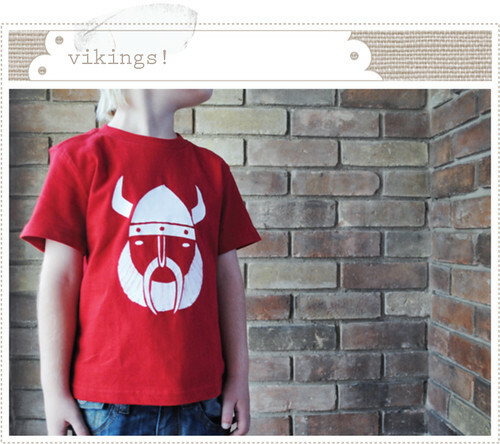 They were nice and all...but, if I am my mother's daughter*, I was pretty sure I wanted to make my own version (I mean we're talking about a viking graphic here! Talk about a cool subject matter!). So we ran out to Target and got the only red blank t-shirt we could find. It was a bit short (Little O will be sporting this pretty soon I'm sure) but it was all we could find as we were up against a clock. 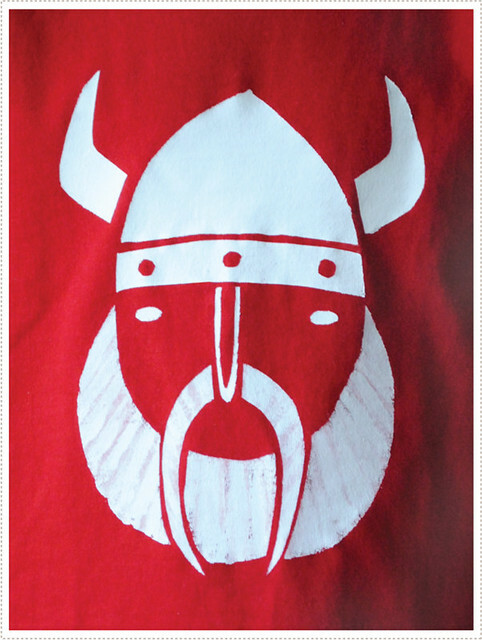 I drew a quick image of a viking on freezer paper, cut out the stencil and ironed it on. I've done a number of freezer paper stencils before but never with a white paint on a red cotton fabric. Let me just tell you, you will have to make several applications of the white paint. We were in "pink" territory for sometime and I was really starting to get worried. But persevere, because it does eventually whiten up. (I'm just pretty sure that we'll never be able to wash the thing as it will most likely end up being too small and I'm afraid Monsieur Viking will be pink all over again...). And if you want to get a bit of beard texture, like mine, just take your sponge brush, hold it upright, and stroke the paint back and forth across the stencil until you are satisfied with the results. 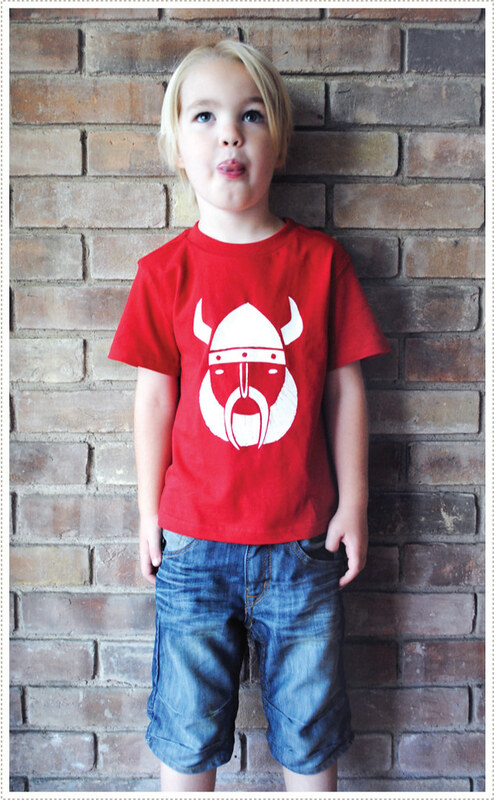 So needless to say, when Little A woke up this morning to discover his newly decked out Viking shirt, he was over the moon (and can I just share that he included a plug for spirit Fridays in his Thursday night prayers? So I'm guessing that this is pretty important for the little guy). And because vikings are just overall totally cool (whether or not they are your school mascot), I've offered the graphic for you to download and use as a stencil as well. Just click on or copy and paste this link into another browser and your download should begin: files.me.com/merrileel/h2j4mz. If you need a freezer paper stencil refresher, you can take a look at this one. *and if you are wondering about the "I am my mother's daughter" comment, I'll share. While growing up my mother would never purchase the school, dance, drama, you name it, required attire. She would simply look at what they were offering and make her own (typically an exact replica for much less $). It drove us crazy as kids (we wanted store bought over handmade every time) but now that I'm grown, I admire her gumption and skills to be able to do so. And in case you are wondering, my viking is not an exact replica (it's an original design) but I felt that it still fit within the spirit day requirements. And if you are wondering about Little A's first day of school, it went smashingly well! I was so proud of the little guy. So thanks for all you well wishes!